I’m so excited to introduce you to our new friends, The Party Animals. These guys are so fun to hang out with, which is good because we’ve been working with them for a while now, getting them party ready for you. They’re lending their cool style to new modern children’s prints, birthday cards, and party invitations + thankyou notes. Each one is hand finished with die cut felt shapes for extra texture and dimension. Meet The Dapper Penguin, The Flying Zebra, The Giant Giraffe, The Flapper Pelican, The Playful Panda, with special appearances from The Party Tiger and The Party Ostrich! I describe them as children’s prints and birthday cards, but to be honest, we love them and we’re adults. Or maybe we’ve just never grown up. I guess there are quite a few of us around because when we had our pop up sale recently, we sold our animal friends to lots of adults for their offices and homes…! We’ve also introduced some pretty special children’s party invitations with complementary thank you notes. As with our other products, each one is hand finished with extra details- in this case felt balloons- guaranteed to make your invites stand out in the party crowd. 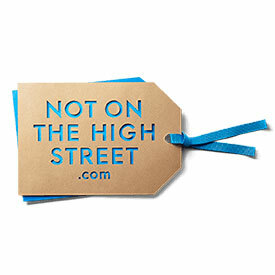 We’re proud to be selling these exclusively through Not on the High Street. So put on your glad-rags, grab your favourite Party Animal, and get ready to have some fun!